A knowledge of atomic and nuclear physics is essential to nuclear engineers, who deal with nuclear reactors. It should be noted that atomic and nuclear physics is very extensive branch of science. Nuclear reactor physics belongs to an applied physics. Reactor physics, particle physics or other branches of modern physics have common fundamentals. Atomic and nuclear physics describes fundamental particles (i.e. electrons, protons, neutrons), their structure, properties and behavior. Atomic and nuclear physics are not the same. The term atomic physics is often associated with nuclear power, due to the synonymous use of atomic and nuclear in standard English. However, physicists distinguish between atomic and nuclear physics. The atomic physics deals with the atom as a system consisting of a nucleus and electrons. The nuclear physics deals with the nucleus as a system consisting of a nucleons (protons and neutrons). Main difference is in the scale. While the term atomic deals with 1Å = 10-10m, where Å is an ångström (according to Anders Jonas Ångström), the term nuclear deals with 1femtometre = 1fermi = 10-15m. 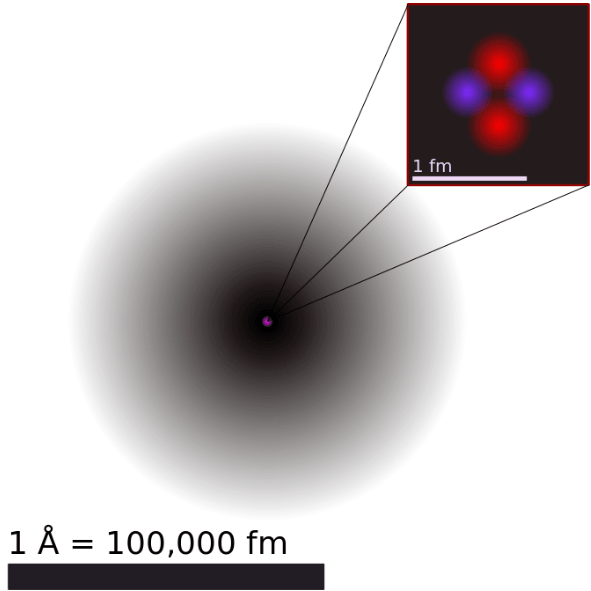 The volume of an atom is about 15 orders of magnitude larger than the volume of a nucleus. For uranium atom, the Van der Waals radius is about 186 pm = 1.86 ×10−10 m. The Van der Waals radius, rw, of an atom is the radius of an imaginary hard sphere representing the distance of closest approach for another atom. Assuming spherical shape, the uranium atom have volume of about 26.9 ×10−30 m3. But this “huge” space is occupied primarily by electrons, because the nucleus occupies only about 1721×10−45 m3 of space. These electrons together weigh only a fraction (let say 0.05%) of entire atom. Nuclear physics is the field of physics that studies the constituents (protons and neutrons) and interactions of atomic nuclei. The most commonly known applications of nuclear physics are nuclear power generation, but the modern nuclear physics contains also particle physics, which is taught in close association with nuclear physics. The nuclear physics has provided application in many fields, including those in nuclear medicine (Positron Emission Tomography, isotopes production, etc.) and magnetic resonance imaging, ion implantation in materials engineering, and radiocarbon dating in geology and archaeology. Quarks and electrons are some of the elementary particles. A number of fundamental particles have been discovered in various experiments. So many, that researchers had to organize them, just like Mendeleev did with his periodic table. This is summarized in a theoretical model (concerning the electromagnetic, weak, and strong nuclear interactions) called the Standard Model. 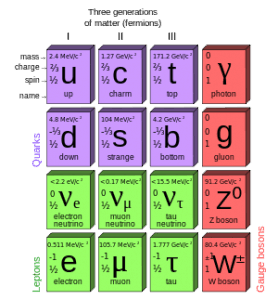 In particle physics, an elementary particle or fundamental particle is a particle whose substructure is unknown, thus it is unknown whether it is composed of other particles. Known elementary particles include the fundamental fermions and the fundamental bosons. The fermions are generally “matter particles” and “antimatter particles”. Antiquarks. For every quark there is a corresponding type of antiparticle. The antiquarks have the same mass, mean lifetime, and spin as their respective quarks, but the electric charge and other charges have the opposite sign. Leptons. The best known of all leptons are the electrons and the neutrinos. Antileptons. For every lepton there is a corresponding type of antiparticle. The best known of all antileptons are the positrons and the antineutrinos. 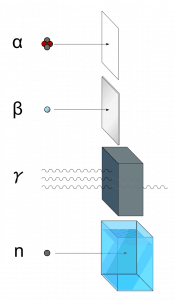 The bosons are generally “force particles” that mediate interactions among fermions. Gauge bosons. The gauge boson is a force carrier of the fundamental interactions of nature. Higgs boson. The Higgs bosons give other particles mass via the Higgs mechanism. Their existence was confirmed by CERN on 14 March 2013. Electrons. The electrons are negatively charged, almost massless particles that nevertheless account for most of the size of the atom. Electrons were discovered by Sir John Joseph Thomson in 1897. Electrons are located in an electron cloud, which is the area surrounding the nucleus of the atom. The electron is only one member of a class of elementary particles, which forms an atom. Protons. The protons are positively charged, massive particles that are located inside the atomic nucleus. Protons were discovered by Ernest Rutherford in the year 1919, when he performed his gold foil experiment. Neutron. Neutrons are located in the nucleus with the protons. Along with protons, they make up almost all of the mass of the atom. Neutrons were discovered by James Chadwick in 1932, when he demonstrated that penetrating radiation incorporated beams of neutral particles. Photon. A photon is an elementary particle, the force carrier for the electromagnetic force. The photon is the quantum of light (discrete bundle of electromagnetic energy). Photons are always in motion and, in a vacuum, have a constant speed of light to all observers (c = 2.998 x 108 m/s). Neutrino. A neutrino is an elementary particle, one of particles which make up the universe. Neutrinos are electrically neutral, weakly interacting and therefore able to pass through great distances in matter without being affected by it. Positron. Positron is an antiparticle of a negative electron. Positrons, also called positive electron, have a positive electric charge and have the same mass and magnitude of charge as the electron. An annihilation occurs, when a low-energy positron collides with a low-energy electron. 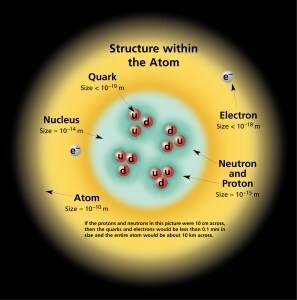 The atom consist of a small but massive nucleus surrounded by a cloud of rapidly moving electrons. The nucleus is composed of protons and neutrons. 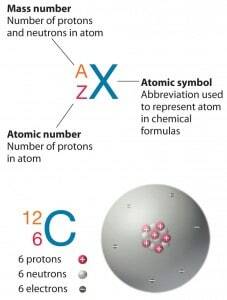 Total number of protons in the nucleus is called the atomic number of the atom and is given the symbol Z. The total electrical charge of the nucleus is therefore +Ze, where e (elementary charge) equals to 1,602 x 10-19 coulombs. In a neutral atom there are as many electrons as protons moving about nucleus. It is the electrons that are responsible for the chemical bavavior of atoms, and which identify the various chemical elements. Hydrogen (H), for example , consist of one electron and one proton. The number of neutrons in a nucleus is known as the neutron number and is given the symbol N. The total number of nucleons, that is, protons and neutrons in a nucleus, is equal to Z + N = A, where A is called the atomic mass number. The various species of atoms whose nuclei contain particular numbers of protons and neutrons are called nuclides. Each nuclide is denoted by chemical symbol of the element (this specifies Z) with tha atomic mass number as supescript. Thus the symbol 1H refers to the nuclide of hydrogen with a single proton as nucleus. 2H is the hydrogen nuclide with a neutron as well as a proton in the nucleus (2H is also called deuterium or heavy hydrogen). Atoms such as 1H, 2H whose nuclei contain the same number of protons but different number of neutrons (different A) are known as isotopes. Uranium, for instance, has three isotopes occuring in nature – 238U, 235U and 234U. The stable isotopes (plus a few of the unstable isotopes) are the atoms that are found in the naturally occuring elements in nature. However, they are not found in equal amounts. Some isotopes of a given element are more abundant than others. For example 99,27% of naturally occuring uranium atoms are the isotope 238U, 0,72% are the isotope 235U and 0,0055% are the isotope 234U. 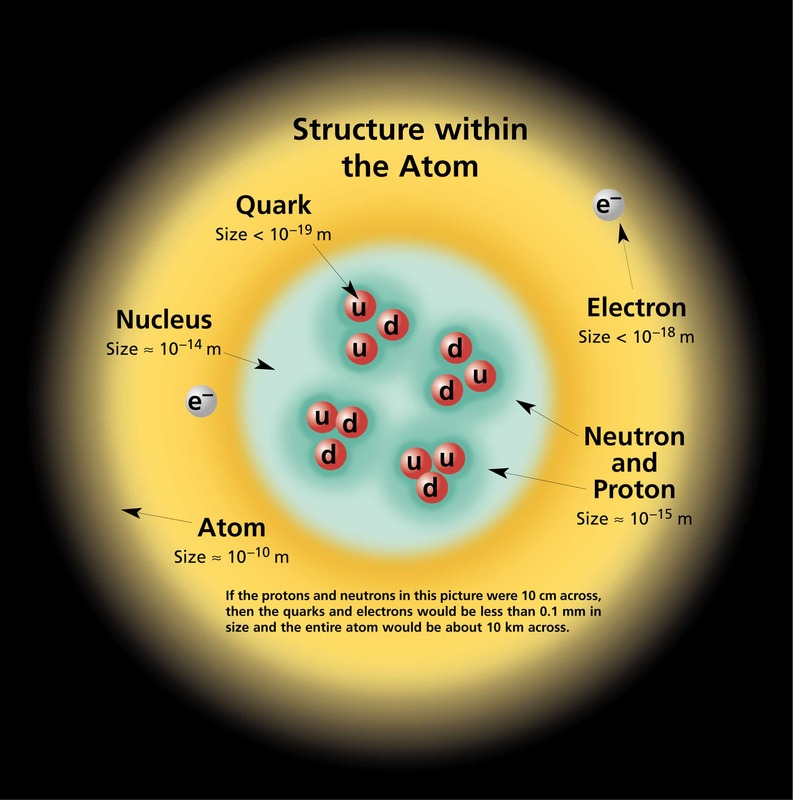 Exact structure of atoms is described by Atomic Theory and Theory of Nuclear Structure. Atomic Theory. Atomic theory is a scientific theory of the nature of matter, which states that matter is composed of discrete units called atoms. The word atom comes from the Ancient Greek adjective atomos, meaning “uncuttable”. Today it is known that also atoms are divisible. Atomic Theory consist of many models and discoveries, which gradually formed this theory. Theory of Nuclear Structure. Understanding the structure of the atomic nucleus is one of the central challenges in modern nuclear physics. This formule describes equivalence of mass and energy. , where M is the small amount of mass and C is the speed of light. What that means? If the nuclear energy is generated (splitting atoms, nuclear fussion), a small amount of mass transforms into the pure energy (such as kinetic energy, thermal energy, or radiant energy). Any time energy is generated, the process can be evaluated from an E = mc2 perspective. Today we use the nuclear energy to generate useful heat and electricity. In 2011 nuclear power provided 10% of the world’s electricity. In 2007, the IAEA reported there were 439 nuclear power reactors in operation in the world, operating in 31 countries. They produce base-load electricity 24/7 without emitting any pollutants into the atmosphere (this includes CO2). Alpha radiations. Alpha radiation consist of alpha particles at high energy/speed. The production of alpha particles is termed alpha decay. Alpha particles consist of two protons and two neutrons bound together into a particle identical to a helium nucleus. Alpha particles are relatively large and carry a double positive charge. They are not very penetrating and a piece of paper can stop them. They travel only a few centimeters but deposit all their energies along their short paths. Photon radiation (Gamma or X-rays). Photon radiation consist of high energy photons. These photons are particles/waves (Wave-Particle Duality) without rest mass or electrical charge. They can travel 10 meters or more in air. This is a long distance compared to alpha or beta particles. However, gamma rays deposit less energy along their paths. Lead, water, and concrete stop gamma radiation. Photons (gamma rays and X-rays) can ionize atoms directly through the Photoelectric effect and the Compton effect, where the relatively energetic electron is produced. The secondary electron will go on to produce multiple ionization events, therefore the secondary (indirect) ionization is much more significant. Nuclei, such as 15O, which are lacking in neutrons (consist of 8 protons and 7 neutrons) undergo positron decay (positive beta decay). In this process, one of the protons in the nucleus is transformed into a neutron, positron and neutrino.The positron and the neutrino are emitted. The number of protons is thus reduced from 8 to 7 (number of neutrons is increased from 7 to 8), so that the resulting nucleus is an isotope of nitrogen, 15N, which is stable. On the other hand nuclei, such as 19O, which have excess of neutrons, decay by negative beta decay, emitting a negative electron and an antineutrino. In this process, one of the neutrons in the nucleus is transformed into a proton. The number of protons is thus increased from 8 to 9 (number of neutrons is reduced from 11 to 10), so that the resulting nucleus is an isotope of fluor, 19F, which is stable. It should be noted that in both positive or negative beta decays the atomic mass number remains the same. Of the first 82 elements in the periodic table, 80 have isotopes considered to be stable. Technetium, promethium and all the elements with an atomic number over 82 are unstable and decompose through radioactive decay. No undiscovered heavy elements (with atomic number over 110) are expected to be stable, therefore lead is considered the heaviest stable element. 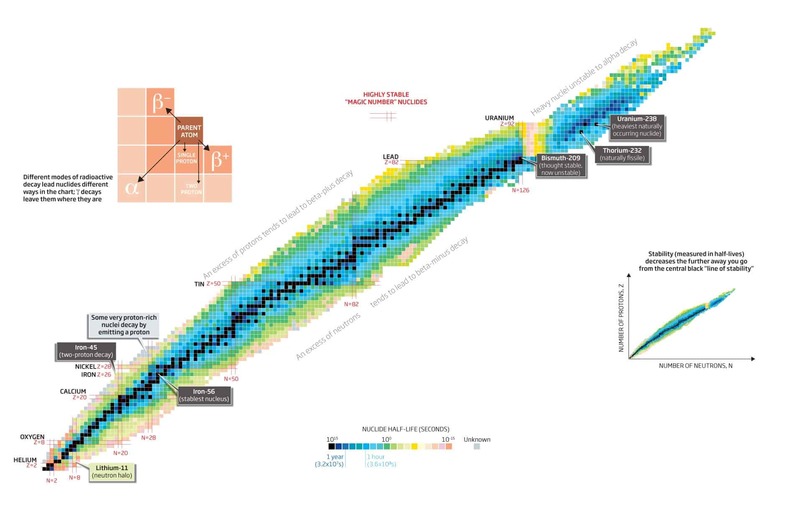 For each of the 80 stable elements, the number of the stable isotopes is given. For example, tin has 10 such stable isotopes. There are 80 elements with at least one stable isotope, but 114 to 118 chemical elements are known. All elements to element 98 are found in nature, and the remainder of the discovered elements are artificially produced, with isotopes all known to be highly radioactive with relatively short half-lives. Bismuth, thorium, uranium and plutonium are primordial nuclides because they have half-lives long enough to still be found on the Earth, while all the others are produced either by radioactive decay or are synthesized in laboratories and nuclear reactors. Primordial nuclides are nuclides found on the Earth that have existed in their current form since before Earth was formed. Primordial nuclides are residues from the Big Bang, from cosmogenic sources, and from ancient supernova explosions which occurred before the formation of the solar system. Only 288 such nuclides are known. The nuclei of radioisotopes are unstable. In an attempt to reach a more stable arrangement of its neutrons and protons, the unstable nucleus will spontaneously decay to form a different nucleus. If the number of neutrons changes in the process (number of protons remains), a different isotopes is formed and an element remains (e.g. neutron emission). If the number of protons changes (different atomic number) in the process, then an atom of a different element is formed. This decomposition of the nucleus is referred to as radioactive decay. 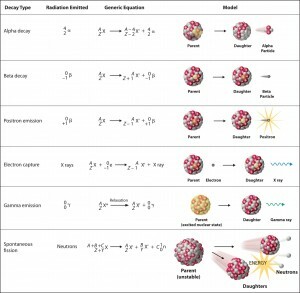 During radioactive decay an unstable nucleus spontaneosly and randomly decomposes to form a different nucleus (or a different energy state – gamma decay), giving off radiation in the form of atomic partices or high energy rays. This decay occurs at a constant, predictable rate that is referred to as half-life. A stable nucleus will not undergo this kind of decay and is thus non-radioactive. Beta radioactivity. Consist of beta particles. Beta particles are high-energy, high-speed electrons or positrons emitted by certain types of radioactive nuclei such as potassium-40. The beta particles have greater range of penetration than alpha particles, but still much less than gamma rays.The beta particles emitted are a form of ionizing radiation also known as beta rays. The production of beta particles is termed beta decay. Gamma radioactivity. Gamma radioactivity consist of gamma rays. Gamma rays are electromagnetic radiation (high energy photons) of an very high frequency and of a high energy. They are produced by the decay of nuclei as they transition from a high energy state to a lower state known as gamma decay. Most of nuclear reactions are accompanied by gamma emission. 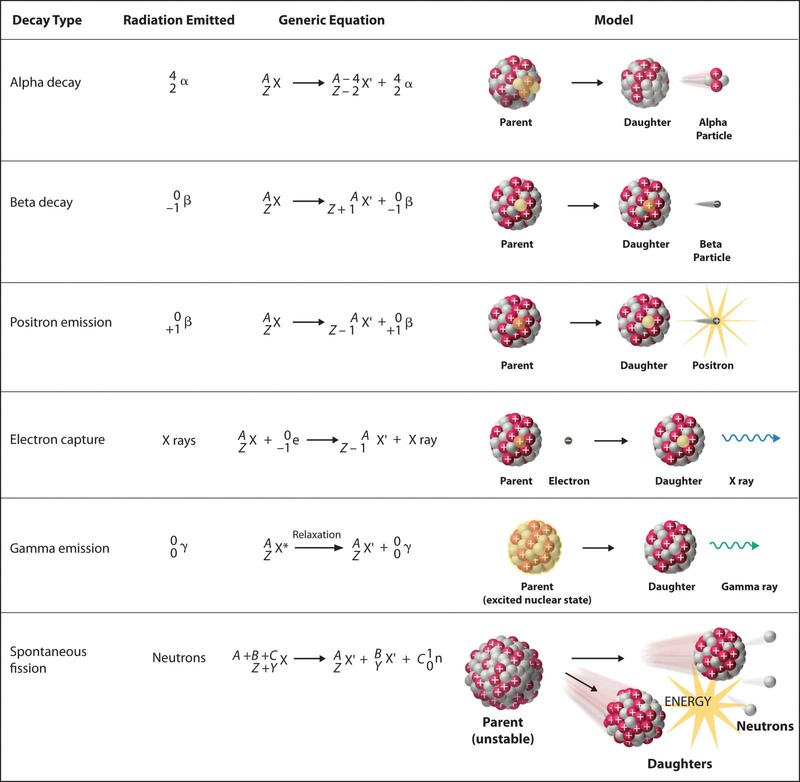 Calculations of the decay of radioactive nuclei are relatively straightforward, owing to the fact that there is only one fundamental law governing all decay process. This law states that the probability per unit time that a nucleus will decay is a constant, independent of time. This constant is called the decay constant and is denoted by λ, “lambda”. The radioactive decay of certain number of atoms (mass) is exponential in time. The rate of nuclear decay is also measured in terms of half-lives. The half-life is the amount of time it takes for a given isotope to lose half of its radioactivity. If a radioisotope has a half-life of 14 days, half of its atoms will have decayed within 14 days. In 14 more days, half of that remaining half will decay, and so on. Half lives range from millionths of a second for highly radioactive fission products to billions of years for long-lived materials (such as naturally occurring uranium). Notice that short half lives go with large decay constants. Radioactive material with a short half life is much more radioactive (at the time of production) but will obviously lose its radioactivity rapidly. No matter how long or short the half life is, after seven half lives have passed, there is less than 1 percent of the initial activity remaining. 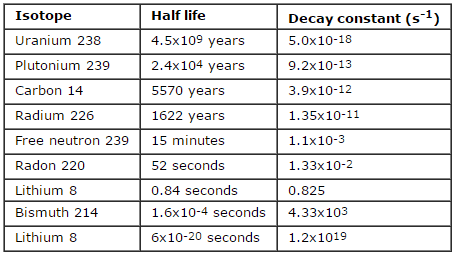 Table of examples of half lives and decay constants. Notice that short half lives go with large decay constants. Radioactive material with a short half life is much more radioactive but will obviously lose its radioactivity rapidly. A nuclear reaction is considered to be the process in which two nuclear particles (two nuclei or a nucleus and a nucleon) interact to produce two or more nuclear particles or ˠ-rays (gamma rays). Thus, a nuclear reaction must cause a transformation of at least one nuclide to another. Sometimes if a nucleus interacts with another nucleus or particle without changing the nature of any nuclide, the process is referred to a nuclear scattering, rather than a nuclear reaction. Perhaps the most notable nuclear reactions are the nuclear fusion reactions of light elements that power the energy production of stars and the Sun. Natural nuclear reactions occur also in the interaction between cosmic rays and matter. Nuclear reactors are devices to initiate and control a chain nuclear reaction, but there are not only manmade devices. The world’s first nuclear reactor operated about two billion years ago. The natural nuclear reactor formed at Oklo in Gabon, Africa, when a uranium-rich mineral deposit became flooded with groundwater that acted as a neutron moderator, and a nuclear chain reaction started. These fission reactions were sustained for hundreds of thousands of years, until a chain reaction could no longer be supported. This was confirmed by existence of isotopes of the fission-product gas xenon and by different ratio of U-235/U238 (enrichment of natural uranium). 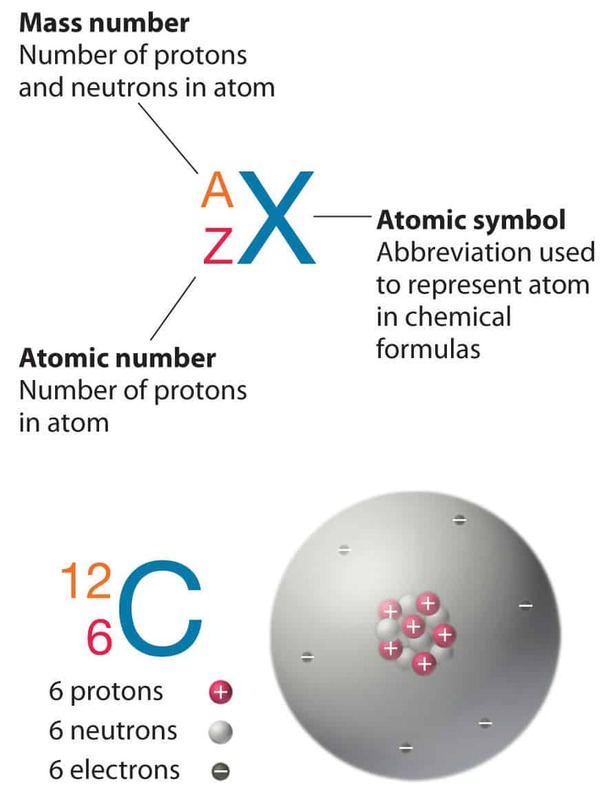 Standard nuclear notation shows (see picture) the chemical symbol, the mass number and the atomic number of the isotope. This equation describes neutron capture in the boron, which is diluted in the coolant. Boric acid is used in nuclear power plants as a long-term compensator of nuclear fuel reactivity. Instead of using the full equations in the style above, in many situations a compact notation is used to describe nuclear reactions. This style of the form a(b,c)d is equivalent to a + b producing c + d. Light particles are often abbreviated in this shorthand, typically p means proton, n means neutron, d means deuteron, α means an alpha particle or helium-4, β means beta particle or electron, γ means gamma photon, etc. The reaction above would be written as 10B(n,α)7Li. Rearrangement Reactions. The absorption of a particle accompanied by the emission of one or more particles is called a rearrangement reaction. Fission reactions. Nuclear fission is a nuclear reaction in which the nucleus of an atom splits into smaller parts (lighter nuclei). The fission process often produces free neutrons and photons (in the form of gamma rays), and releases a large amount of energy. Reference: Lamarsh, John R. Introduction to Nuclear engineering 2nd Edition. At atomic level the atomic binding energy of the atom derives from electromagnetic interaction of electrons in the atomic cloud and nucleons (protons) in the nucleus. The atomic binding energy is the energy required to disassemble an atom into free electrons and a nucleus. This is more commonly known as ionization energy. At molecular level the molecular binding energy of the molecule derives from bond-dissociation energy of atoms in a chemical bond. At nuclear level the nuclear binding energy is the energy required to disassemble (to overcome the strong nuclear force) a nucleus of an atom into its component parts (protons and neutrons). The component parts of nuclei are neutrons and protons, which are collectively called nucleons. The mass of a nucleus is always less than the sum masses of the constituent protons and neutrons when separated. The difference is a measure of the nuclear binding energy which holds the nucleus together. According to the Einstein relationship (E=m.c2) this binding energy is proportional to this mass difference and it is known as the mass defect. If the splitting releases energy and the fusion releases the energy, so where is the breaking point? For understanding this issue it is better to relate the binding energy to one nucleon, to obtain nuclear binding curve. The binding energy per one nucleon is not linear. There is a peak in the binding energy curve in the region of stability near iron and this means that either the breakup of heavier nuclei than iron or the combining of lighter nuclei than iron will yield energy. The reason the trend reverses after iron peak is the growing positive charge of the nuclei. The electric force has greater range than strong nuclear force. While the strong nuclear force binds only close neighbors the electric force of each proton repels the other protons.